But first a word about what's not yet released: the in-game building tool. We decided to delay it as we felt it needed more work. Most of the progress is hidden but some of the changes we've made in preparation for it are visible in 0.3.4: a 'Max' tool in the Voxel Editor and the in-game tool selector. '2' and '3' are currently deactivated. They're reserved for building. The symbol in the crosshair at the center of the screen changes according to the tool selected. To spawn a turret, players select '4' on the keyboard, then click with the mouse. The turret will appear in front of them. Turrets can be deployed on surfaces and in space. They don't change position even when the terrain is destroyed around them. Turrets are very strong and have a higher firing rate than the flying drones. They're susceptible to friendly fire. 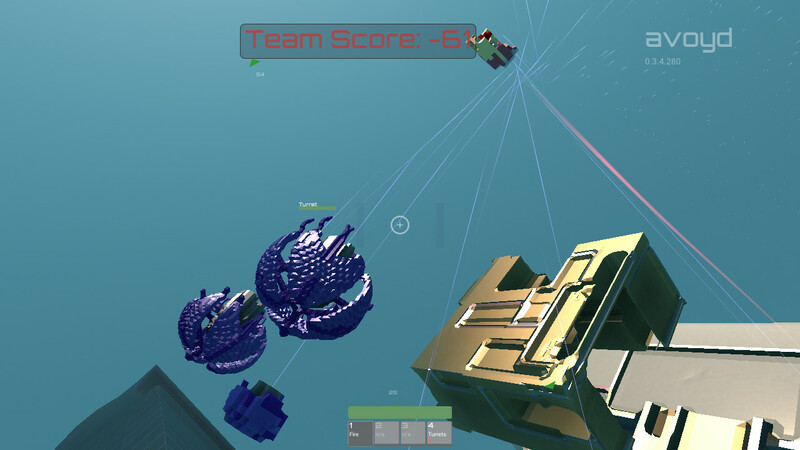 Players can spawn up to four turrets, with a cooldown between spawns. The number of turrets available to spawn is shown at the bottom of the turrets tool box. The counter decreases each time a turret is deployed. When a turret is destroyed the count goes up by one. Once the max number of turrets is reached the cooldown lengthens and the next spawn replaces the first turret deployed and so-on. 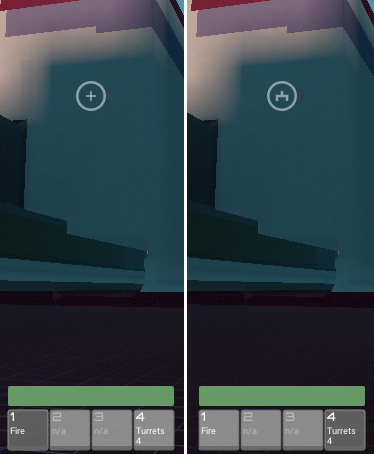 The turret cooldown is shown as a small progress bar at the bottom of the turret tool box. The crosshair symbol also becomes darker during cooldown to remind players they have to wait before they can spawn the next turret. 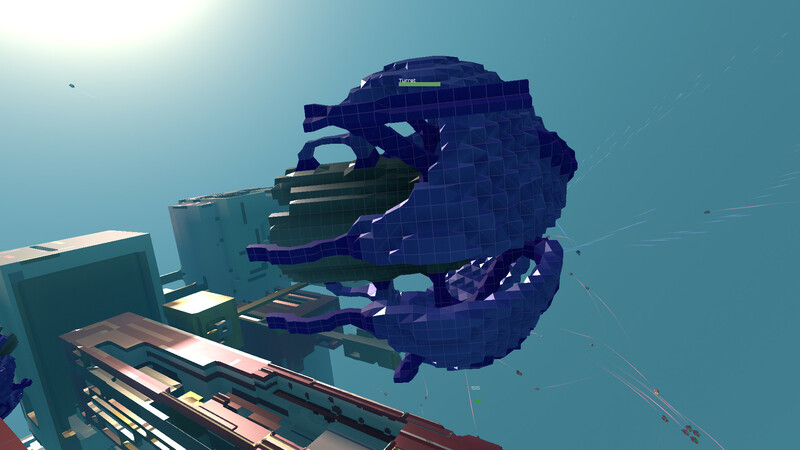 Turrets use a similar very basic AI system to the other drones in the game, except without any movement. 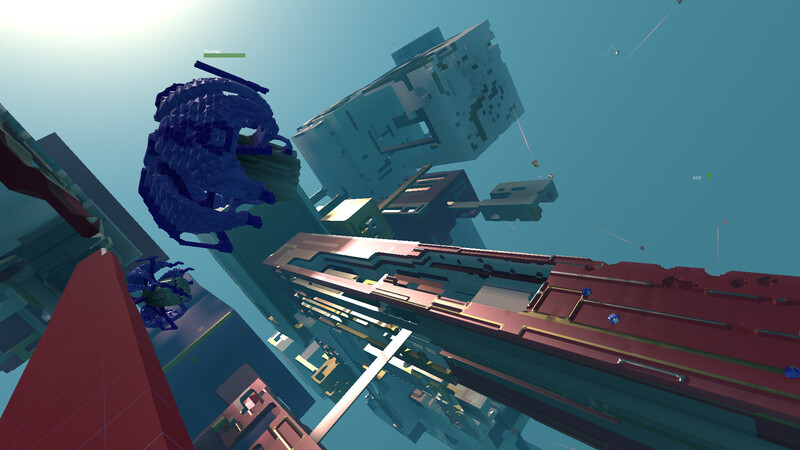 The turrets randomly pick a potential target which is in view, and in range to fire at. If they can't they spin around looking for one whilst avoiding looking at the ground. 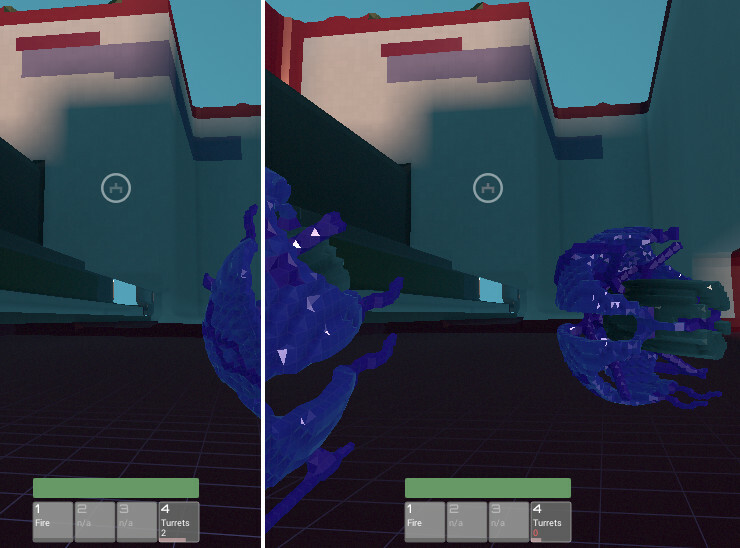 The spawning of turrets uses a new 'ToolSpawnSystem' (Avoyd uses a component system approach), and on the client this sends a spawn request message which is processed on the server. Avoyd uses messaging internally, so a stand alone client or a client which is also acting as a server also uses the same system. Clients track the number of requests they've made to prevent superfluous messages, and reliable messaging is used. The server sends a message back to the client to inform them which entity their spawned turret is for book keeping and eventually permitting more refined client side control over their turrets along with better turret information displays. The in-game HUD uses NanoVG with a very light C++ wrapper so we can use our own math primitives. Whilst we use dear imgui for the rest of the UI, NanoVG is better for animated content and the lack of automatic layout and input handling isn't an issue for HUD elements. Eventually turrets will tie into the other build and resource features of the game, but they already offer a significant upgrade. Playing with turrets in the game opens up a surprising number of tactical choices and we think it substantially increases the fun of playing.